In Dangerous Crossing, a young bride is set to begin her honeymoon aboard a luxury liner. Her happiness does not last when she finds that her husband has disappeared. Trouble is, no one else ever saw him board the ship with her. And his name has mysteriously dropped from the passenger list. I have to say that I enjoyed watching Dangerous Crossing recently. It’s the story of a newlywed wife, going on her honeymoon cruise with her husband. But her husband disappears, and she’s registered under her maiden name. With no wedding ring, license, or evidence that her husband’s on the boat. At first, it appears to be a psychological thriller – is the newlywed crazy? Jeanne Crain turns in a wonderful acting performance. She’s certain of her husband, and eventually, the audience realizes it as well, when she receives a late-night phone call from him. Her missing husband warns her to not trust anyone on board the ship. But the ship’s crew wonders. And the handsome ship’s doctor (Michael Rennie in a very good performance) takes a special interest in her. At first, a professional interest. She begins getting increasingly frustrated, making the ship’s captain think that she’s erratic, and possibly dangerous. The doctor talks with her, and finds out that she has no history of mental illness. She was depressed after the death of her loving father, a wealthy industrialist, until she met her husband. But the rest of the crew isn’t convinced, and the captain plans to restrain her in her cabin. I won’t give away the conclusion, except to say that all of the pieces fit together, and ends with a dramatic death. And oddly, even with a bit of hope. For more information, you’ll have to watch the movie for yourself. 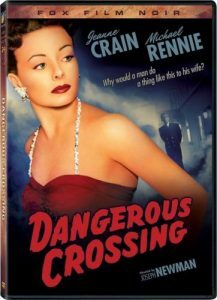 I truly enjoyed Dangerous Crossing and recommend it. I rate it 4 stars out of 5. Hours later, John hasn’t returned, and no one has seen him. Ruth’s inquiries uncover an empty room, a missing passport, and her spouse’s absence from the passenger list. All signs point to delusion. Ruth’s plight brings her to the attention of Dr. Paul Manning (the elegant Michael Rennie, The Day the Earth Stood Still), who offers to help in any way he can. Though Ruth confesses to a brief bout with depression, there’s nothing else in her background to indicate instability, but that disclosure leads Manning to the real cause of her distress.